I’ve started writing this post at least six times since the end of last year. Each time I’ve gotten about 200 words in and just wanted to slap myself for being a whiney and ungrateful cow. You see, 2015 was an amazing year for me. I ticked many boxes both personally and professionally and should have hit December 31 riding on a massive high. Unfortunately this event in February, something that was a terrible piece of bad luck, is still causing instability and uncertainty in our lives. And for that reason I found myself ending the year feeling quite resentful. I don’t mind dealing with uncertainty and instability because of my own incompetence and negligence … but because of simple bad luck? That wasn’t sitting well with me. Then over the course of New Year’s Eve and New Year’s Day, two things happened that turned the way I looked at ‘luck’ on its head. On NYE night Ant and I came back from watching NYE fireworks with Jaden to find Ant’s mum just coming out of the room Mia was sleeping in. (We were staying at her house that night and she’d been sitting in there with Mia till she fell asleep. And Mia had only just fallen asleep.) Given it was 9.45pm and we’re typically in bed at 8.30pm we decided to call it a night. As we were brushing our teeth we smelled something burning. A minute later we realised the burning smell was coming from the lamp we’d draped a blanket over to cut the light down (yes, don’t do this folks). When we pulled the blanket off we found the lampshade collapsed and melted and the blanket smouldering. Jesus. So you could argue thus us deciding to go to bed when we did was a piece of Very Good Luck. The next day we were at the beach and there was a guy having a bit of trouble getting his 4WD (with heavy trailer attached) back up a nearby ramp. He kept slipping back in the soft sand and everyone nearby was a bit edgy at the apparent lack of control he was having over his vehicle. That’s when I noticed what looked like a little boy running towards the 4WD and thought to myself ‘Where are that kid’s parents?’. The ‘little boy’ was Mia. She looked like a little boy because she was clothed only in Jaden’s jocks. (I had no bathers for her that day and she’d suddenly decided for the first time all summer that she loved the water). Needless to say, I’ve never moved so fast in my life. Getting to her in time to prevent a disaster was another piece of Very Good Luck. These two incidents got me realising that while pieces of genuinely terrible bad luck are quite rare in life, good luck is happening all the time. There are the things we don’t even realise have occurred (near misses while we’re driving cars or riding our bikes on the road). There are the things we DO know about but take completely for granted (the people we were born to, the country we were born in, the support structures we have around us). And then there is everything in between (those two near misses we had with Mia, a breast biopsy I had before Christmas coming back clear). So it’s become very clear that while we may have had one piece of Very Bad Luck last year, the amount of good luck we’re having on a daily basis really outweighs that to infinity. Every year I choose a word/phrase to guide my year. In previous years that word has been ‘No’, ‘Float’ and ‘Whitespace’. For 2016 I was going to choose the phrase ‘embrace uncertainty’ because if there’s one thing 2015 showed me, it’s that no matter how much I think uncertainty can be managed/controlled out of life, it can’t. The love and respect of my husband, kids, wider family and friends. Feeling safe both in my home and while out on the streets going for a walk or a run. Speaking of home, I was certain about having one of those, along with the ability to feed my family. Then it occurred to me to look at Maslow’s hierarchy of needs, and when I did, I’m almost embarrassed to report that every single item in the entire hierarchy is present in my life. It seems that what I am calling ‘uncertainty’ is actually a scarcity complex: I am placing higher value on an object that is scarce (control over one specific ‘thing’), and a lower value on those that are abundant. For someone who considers themselves both highly self-aware and uber-grateful for all that is good in their life, this is kind of mortifying. 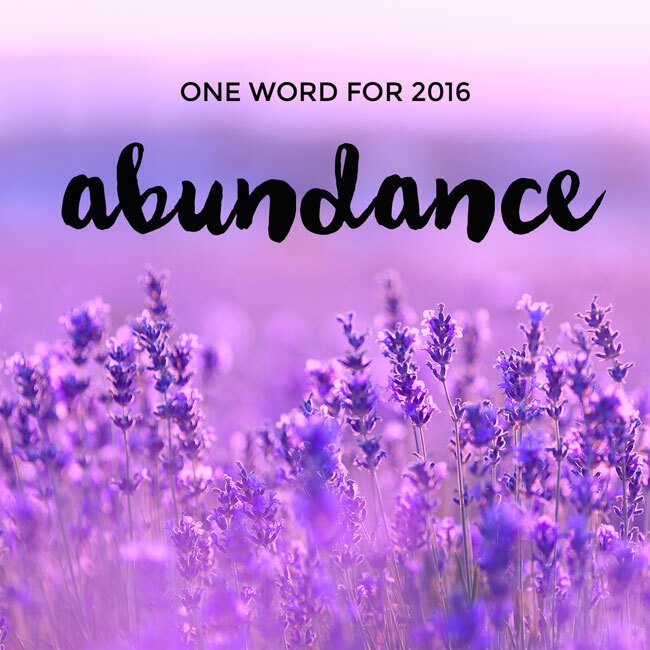 So all of the above – the good luck, the ridiculous number of things I am certain about – these are the reasons I’ve decided that my word for 2016 needs to be Abundance. A celebration of the extreme levels of certainty, comfort, happiness and love in my life. It’s quite funny. My friend Malini gave me a book with that same title a good few months ago and it’s been sitting on my bedside table waiting to be called up to the plate. Well, it’s been called up now and I’ve been devouring it for the past week.